ALL THE TIME GOD IS GOOD! : Understanding Grace: Is Radical Grace against repentance? Understanding Grace: Is Radical Grace against repentance? We have been in an extended study concerning God's amazing, over the top Grace. We've been allaying the many myths associated with the message of Grace as of late. Radical Grace isn't the message that celebrates sin and lasciviousness. It isn't a message of inaction and passivity. Grace once received, produces empowerment and brings greater understanding of who we are because of Christ. One last myth I wish to put to rest is the idea that Radical Grace is somehow opposed to repentance. I am aware why some may perceive this about the message of Grace. The source of the contention is the definition of repentance. This is yet another reason for the rejection of Grace. Men cling to a dictionary and Latin definition of repentance. Whenever truth comes it lays aside the traditions of men. When tradition is laid aside some men fight to keep their traditions on the forefront if you will. In order to better understand where I am coming from let's define what repentance is not. This mindset perhaps is rooted in the misapplied and misunderstood Scripture 1 John 1:9. This passage is written to the human who is a sin denier. Those who have refused the free gift because they don't believe sin exists. Or they feel their works and intellect is more than enough to stand before God. Some, however, have turned this passage into the Christian's bar of soap when they blow it. 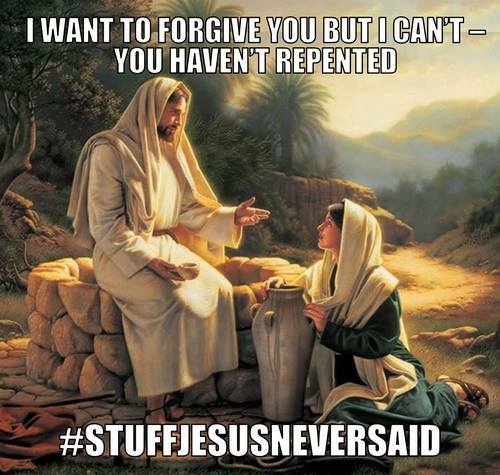 Because of this, many feel that confessing and repentance are equal parts or two sides of the same coin. 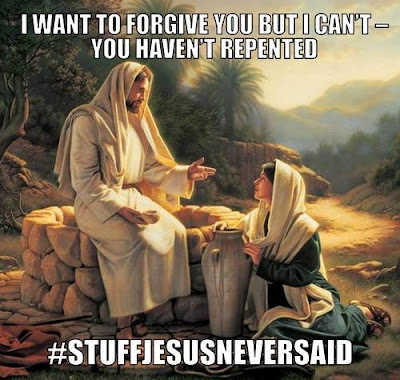 They then see repentance as some apology principle. That God withholds forgiveness until we feel bad and receives an apology. This concept is rooted in error and wrong thinking. Jesus has forgiven us on that Cross. He took our past and present and future sins and paid for them in His Finished Work. We are perfectly forgiven. Now, if it helps one to receive of the Finished Work to ask for forgiveness when they miss it, by all means ask away. You don't need to though because having received Jesus also means we received all He purchased for us in His great work of redemption. This is where the dictionary and Latin definition of the word repent get people caught up. So many seem to define repent as a turning away from something. Some have gone so far as to rip the assurance and security the Finished Work purchased for the believer by wielding this definition. Some teach that if you blow it or mess up and ask God for forgiveness, but continually repeat the same mistake, you haven't really repented. You must turn from that sin and not commit it again. Only then will God actually forgive you. I have heard this concept taught in many holiness circles. To repent is to change one's mind. This is the Bible definition of the word repent. So, Radical Grace isn't opposed to the changing of the mind. We all had a change of mind when we received the good news of the Finished Work and Grace. We changed our mind from trusting in our performance and began trusting in Christ's Finished Work. Lay aside the weight and traditions of dead religion. Come embrace the Radical Grace of Almighty God. Receive the truth that you're salvation is eternally secure. Receive the truth that you are forgiven of all of your sins. Receive the truth that you've been made worthy as God is because of the Blood. Identify with Jesus, as He is now so are we. This is understanding the Radical Grace of Almighty God.